2. Combine rosemary, basil, garlic, salt and pepper and set aside. Brush inside of baguette halves with olive oil. Sprinkle evenly with herb mixture. 3. 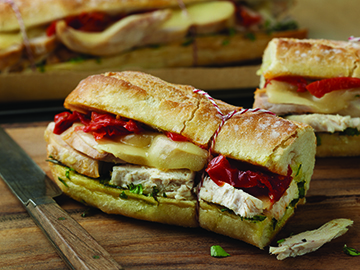 Place sliced chicken, Provolone and sundried tomato strips evenly on one baguette half. Put other half of baguette on top, press down slightly and tie the baguette, at 2-inch intervals, with kitchen string, if desired. 4. Put baguette on a baking sheet and into the hot oven. Bake until warmed through and cheese is melted, about 10 to 12 minutes. 5. Remove from oven and let rest for 5 minutes. Remove strings and cut into quarter before serving.